The fascinating discovery of a labyrinthine network of graves dates back to 1578 , hidden deep beneath the Roman roads. The tombs housed the skeletons of the first Christian martyrs , sanctified in honor of their courageous and stainless support of the Christian faith. Most of these skeletons, called “Saints of the catacombs” by those who first discovered them, were carried around Europe (especially in Germany) to replace the priceless sacred relics destroyed , stolen or ruined during the Protestant Reformation . 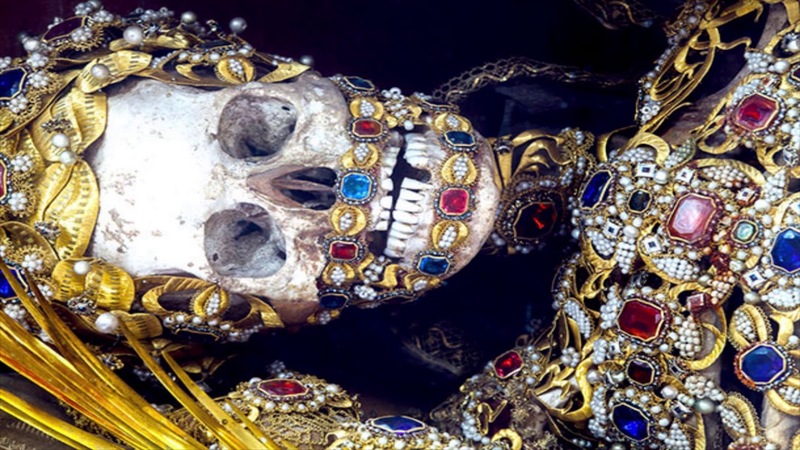 Once delivered, each skeleton was dressed and adorned with a large variety of precious jewels, expensive clothes, crowns, armor and even wigs. They were put on display inside the churches designated to remind those who entered the wealth and well-being that awaited them after death, provided they swore to remain faithful to Christianity. It looks like a novel by Dan Brown, is not it? In reality everything is accurately demonstrated. The art historian and relic hunter Paul Koudounaris , fascinated by the discovery and the history that is hidden behind the “Saints of the catacombs”, has traveled throughout Europe to search and document the status of each saint . Incredibly, most of the skeletons are still waiting to be put on display, stored in containers waiting to be dressed and revealed to the public. Her book Heavenly Bodies: Cult Treasures & Spectacular Saints from the Catacombs explores the origins and history of the “Saints of the Catacombs” by asking a few questions, such as: Who were they? How exactly did they die? Who ordered their location in the catacombs? And why have they remained so long forgotten by religious institutions? His work provides an important documentation of some of the most elaborate and forgotten relics of a bygone era.